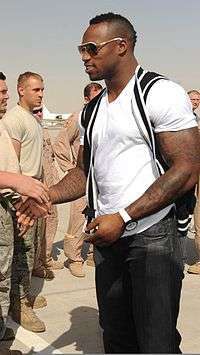 Vernon Leonard Davis (born January 31, 1984) is an American football tight end for the Washington Redskins of the National Football League (NFL). He played college football at Maryland. He was drafted by the San Francisco 49ers sixth overall in the 2006 NFL Draft. Upon entering the league, Davis signed a five-year, $23 million deal that made him the highest paid tight end at the time. In 2009, Davis co-led the NFL in touchdown receptions. In the 2011–12 NFL playoffs with the 49ers, Davis caught the game winning touchdown pass from Alex Smith against the New Orleans Saints, which was referred to as "The Catch III". In 2015, Davis was traded to the Denver Broncos, where he ended up winning Super Bowl 50 with the team against the Carolina Panthers. Davis attended Truesdell Elementary in Washington, D.C, and later attended Paul Public Charter School for middle school. However, Paul did not have a football team, and thus, Davis played for neighboring MacFarland Middle School. He would go on to attend Dunbar High School in Washington. He was a letterman in football, basketball, and track and field. Rated as a four-star recruit by Rivals.com, Davis was listed as the No. 4 tight end prospect of the class of 2003. While attending at Dunbar, he was teammates with future New York Jets kick return specialist and wide receiver, Josh Cribbs. In track & field, Davis recorded a personal best of 10.7 seconds in the 100 meters, and was the DCIAA champion in the high jump with a jump of 6 ft 6 in (198 cm). He was also a member of the 4 × 100 m (43.68s) relay squad. Davis played tight end and safety but he also played wide receiver, kick returner, linebacker and defensive end. In his senior season he caught 21 passes for 511 yards and 5 touchdowns, despite missing three games with a deep bone bruise below his knee. He also caught three two-point conversions and returned two kick offs and two punts for touchdowns. He had 35 receptions for 385 yards as a junior. Davis returns a kickoff during a 2005 game vs. the Clemson Tigers. Davis enrolled in the University of Maryland, where he majored in studio art and played for the Maryland Terrapins football team. In 2003, Davis saw the most consistent action of any true freshman, playing in all thirteen contests. He had five receptions for 87 yards (11.8 avg) and led the kickoff coverage unit with eight solo tackles. In 2004, he played in every game, starting at H-back against Northern Illinois, Duke, Georgia Tech, Clemson, Virginia Tech and Wake Forest. He finished second on the team with 27 catches for 441 yards and had 16.3 avg and three touchdowns. In 2005, Davis was a Consensus All-American and All-Atlantic Coast Conference first-team selection. He was a finalist for the Mackey Award, given to the nation's top tight end. He started every game, leading the team with 51 receptions and the conference with 871 receiving yards (17.1 avg). His six touchdown catches rank tenth on the school's season-record list. His 51 receptions also rank tenth on the Terps’ annual record chart while his 871 yards rank fifth. He was graded 82.5% for blocking consistency as he registered 67 knockdowns, including 18 blocks down field and had eight touchdown-resulting blocks. Davis was heavily involved with working out in college. He set school strength records (in spring of 2005) for a tight end in the bench press (480 pounds), power-clean (380 pounds), index (824 pounds) and squat (685 pounds). He finished his college career with 1,371 yards on 83 receptions for 16.5 yards per catch, the best average of any first round tight end ever and more yards than other previous high first round tight ends such as Tony Gonzalez, Jeremy Shockey, Kyle Brady and Kellen Winslow II. Davis was selected 6th overall in the 1st round of the 2006 NFL Draft by the San Francisco 49ers. He joined Kellen Winslow Jr. as the fourth highest tight end ever drafted after Ron Kramer, (Green Bay, No. 4 in 1957) Mike Ditka (Chicago, No. 5 in 1961) and Riley Odoms (Denver, No. 5 in 1972). He was the top tight end prospect in the NFL Draft, partially due to a strong performance at the scouting combine. He ran the 40 yard dash in 4.38 seconds. Davis also broad-jumped 10'08", nearly a foot farther than the next-best tight end, Marcedes Lewis. Vernon's first reception in the NFL was a 31-yard touchdown catch, against the Arizona Cardinals on September 10, 2006. He added a career-long 52-yard touchdown against the Green Bay Packers on December 10 with a short catch followed by a long run. Davis played in ten games in the 2006 season due an injury he suffered on September 24, 2006. He sustained a hairline fracture to his left fibula, on a non-contact play against the Philadelphia Eagles, but returned on November 19 against the Seattle Seahawks. For the season, he had 265 yards receiving on 20 catches, averaging 13.2 yards per reception. He also had three receiving touchdowns. In Week 3 of the 2007 season, Davis was injured while attempting to catch a pass from quarterback Alex Smith against the Steelers. Davis sprained his right knee and missed the next two games. Despite his injury and the 49ers' offensive ineptitude, Davis bettered most of the numbers from his rookie season. Even though his yards per reception diminished, he finished the season with 52 receptions for 509 yards and four touchdowns. During October 2008, after catching a seven-yard pass in the third quarter, Davis slapped Seahawks safety Brian Russell in the facemask, resulting in a 15-yard penalty, causing Coach Mike Singletary to bench him and then send him to the locker room for the game's remainder. After the game, Mike Singletary then spoke his famous "I want winners" rant. This resulted in Vernon Davis changing his attitude from himself, to the team. The following game Vernon Davis leaped over a Cardinal defender and caught a pass from Shaun Hill resulting in a touchdown, his first of the season. He started all 16 regular season games, and finished the season with 31 receptions for 358 yards, and two touchdowns. Through week 11 of the 2009 season, Davis led the NFL with nine touchdown receptions, tied with wide receivers Larry Fitzgerald and Randy Moss. In the final game of the season, he tied the all-time record for most touchdown receptions for a tight end in a single season (13), sharing the record set by Antonio Gates in 2004; that record stood until 2011, when it was broken by Rob Gronkowski. He was also selected to appear in his first Pro Bowl. Before the 2010 season, he was awarded a five-year contract extension for $37 million with $23 million guaranteed. The deal made Davis the league's highest paid tight end. Against the Oakland Raiders in week six, he recorded his third straight game with a touchdown catch. Davis finished the season with 56 catches and 914 yards, resulting in 16.3 yards per catch. Davis had 67 receptions for 792 yards with 6 touchdowns during the 2011 season, helping the 49ers win the NFC West division and make the postseason for the first time since 2002. In the playoffs in the divisional round against the New Orleans Saints, he had seven receptions for 180 yards, breaking Kellen Winslow's record (166) for most yards by a tight end in a playoff game. He scored two touchdowns, and on the game-winning drive, he had a critical 47-yard reception that put the 49ers in a position to tie the game. With nine seconds remaining, Davis caught the game winning touchdown pass from Alex Smith, now referred to as "Vernon Post". Davis caught three passes for 112 yards and another two touchdown against the New York Giants in the NFC Championship Game, but the 49ers lost 20–17 in overtime. During the 2012 season, Davis caught 41 passes for 548 yards and 5 touchdowns. The 49ers would eventually enter the NFC Championship for the second straight season to face off against the Atlanta Falcons. Despite trailing 0-17, the 49ers won the NFC Championship game against the Falcons 28-24, allowing the 49ers to enter the Super Bowl for the first time in 18 years. In Super Bowl XLVII Davis had 6 catches for 104 yards in the loss to the Baltimore Ravens 34-31. Davis began the 2013 season much like the 2012 playoffs ended: as a trusted and reliable target for quarterback Colin Kaepernick, catching his first touchdown pass of the season in the first quarter of the first game, at Candlestick Park on September 8, 2013. He added two touchdown receptions in the 2013 NFC Playoffs, one coming against the Green Bay Packers in a Wild Card Round victory, and another in a Divisional Round victory against the Carolina Panthers. During the 2014 season, Davis only caught 26 passes for 245 yards, and two touchdowns (both in week 1 against the Dallas Cowboys). He was dealing with ankle and back issues, which hindered him most of the time during the season. On November 2, 2015, Davis and a 2016 seventh-round draft pick were traded from the San Francisco 49ers to the Denver Broncos for sixth-round picks in 2016 and 2017. His first game as a Bronco was against his brother Vontae and the Indianapolis Colts. With Brock Osweiler as the starting quarterback, he had 4 receptions for 69 yards in a 17-15 win over the Chicago Bears. He then added a combined 4 receptions for 35 yards in wins against the New England Patriots and San Diego Chargers. Davis had a season-high 7 catches for 74 yards in a 15-12 loss to the Oakland Raiders. Davis won his first Super Bowl after the Broncos defeated the Carolina Panthers 24-10 in Super Bowl 50. Despite ending the day with no receptions, Davis made a key block downfield during a 34-yard run by teammate C. J. Anderson, the longest rush of the game. On March 31, 2016, Davis signed a one-year contract with his hometown Washington Redskins. In a week 6 game against the Philadelphia Eagles, Davis caught his first touchdown pass in over two years, helping the Redskins win their fourth straight game of the season. Davis had started the game in replacement of an injured Jordan Reed and finished with 2 receptions for 50-yards and a touchdown. The following week, he earned his third start in a row and finished with six receptions for 79 receiving yards in a 17-20 loss to the Detroit Lions. On October 30, 2016, Davis caught 5 passes for 93-yards in a 27-27 tie with the Cincinnati Bengals. During a Week 9 matchup with the Minnesota Vikings, he caught 3 passes for 66-yards and caught a 38-yard touchdown receptions during the Redskin's 26-20 victory. Davis is nicknamed Duke because he looks very similar to his father, whose name is Duke. College teammates later changed his nickname to "The Duke," and "Cyborg", a nickname earned playing for the Maryland Terrapins. Davis' brother, Vontae Davis, is currently a cornerback for the Indianapolis Colts. Davis' brother, Michael Davis, was arrested in the Petworth area of Washington, D.C. on Thursday, April 27, 2012 for two counts of assault with intent to kill while armed. Michael is suspected of three similar attacks for which there is an investigation but no charge. Davis made a cameo appearance in the music video for the song "Get Lo" by Ron Artest and Mike Jones. Davis also made an appearance on Pretty Wild. Davis is an avid curling fan. He hosted an event for his charity in San Jose, CA in which the event was curling. Davis was named honorary captain of the Men's U.S. Olympic Curling team for the 2010 Winter Olympics in Vancouver. He attended most of the team's matches and is considered an ambassador for the game. Ahead of the 2010 game against the Denver Broncos at Wembley Stadium in London, Davis announced that he is a fan of the English premiership team West Ham United. In late 2010, Davis founded Modern Class Design (MCD) with business partner Antone Barnes. Modern Class Design is a full-service fine arts and interior design company that offers comprehensive design services for homes and commercial spaces including interiors and landscape architecture. Vernon Davis also owns a chain of Jamba Juice Franchises. In December 2012, Davis opened Gallery 85 on Santana Row in San Jose, Ca., an art gallery for new and emerging artists giving them access to high end exposure. Davis is serious about his fitness. "During the off-season," he said in an interview, "I lift for endurance. I’ll start with 205 pounds and rep it out, then go up to 225 and rep it out, and 245 and rep it out. Then I’ll come back down—245 and rep it out, 225 and rep it out, and so on. I also do explosive drills with trainers I’ve been working with for years. What really works is doing resistance work, with another guy behind me holding a rope tied around my waist. During the season, I lift heavy. I might go up to 435 pounds. I love the bench, it's always been one of my favorite lifts for strengthening my core." In a televised Thanksgiving 2014 advertisement, Davis revealed that one of his favorite foods was a yam. In October 2013, it was reported that Davis would be offering stock in his future earnings via a venture with Fantex as part of a new financial instrument being sold by Fantex. Davis planned to offer a 10% share of all future earnings from his brand marketing company to Fantex, which would then turn around and divide it into shares of a tracking stock that can be traded within their own exchange. In January 2014, the stock offering was confirmed. The proposed offering was 421,100 shares, valued at $10 per share, for a total proposed valuation worth $4.2 million. ↑ "Tight ends 2003". Rivals.com. February 5, 2003. ↑ "Super Bowl Spotlight: Vernon Davis". Muscle & Fitness. ↑ "Fantasy Football Breaking News". Rotoworld.com. Retrieved 2016-03-31. ↑ "Vernon Davis: The Sixth Lineman". Bleacher Report. 2009-01-11. Retrieved 2016-03-31. ↑ "Vernon Davis NFL Football Statistics". Pro-Football-Reference.com. 1984-01-31. Retrieved 2016-03-31. 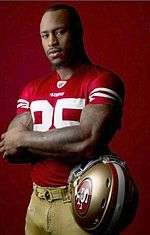 ↑ 49ers Tight End Vernon Davis Says His Best Work Lies Ahead, AOL News, September 12, 2010. ↑ 49ers make Davis the NFL's highest paid tight end Archived September 14, 2010, at the Wayback Machine., The Sacramento Bee, September 12, 2010. ↑ "Giants stun 49ers with OT FG to set up Super rematch with Patriots". ESPN.com. Associated Press. Archived from the original on January 23, 2012. ↑ Hanzus, Dan (November 2, 2015). "Vernon Davis traded by 49ers to Denver Broncos". NFL.com. Retrieved January 18, 2016. ↑ "Vernon Davis leaving San Francisco via trade after 10 seasons". ESPN.com. November 2, 2015. Retrieved November 2, 2015. ↑ "C.J. Anderson's Outside Zone Run for 34 Yards in Super Bowl 50". NFL Breakdowns. February 11, 2016. Retrieved February 19, 2016. ↑ "Redskins sign TE Vernon Davis to one-year deal". NFL.com. Retrieved 2016-04-06. ↑ "With Vernon Davis In The Mix, Niles Paul Is Ready For The Competition". www.redskins.com. Retrieved 2016-04-06. ↑ Mattern, Perry. 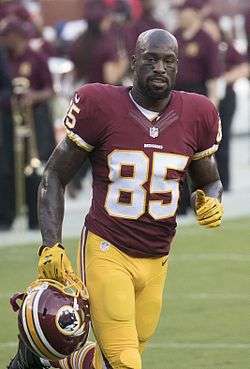 "Vernon Davis Shakes Off Penalty, Steps Up For Redskins". Redskins.com. Retrieved 17 October 2016. ↑ "NFL Player Profile:Vernon Davis". NFL.com. Retrieved November 20, 2016. ↑ Jackman, Tom (April 28, 2012). "Michael Davis Held Without Bond in Petworth Hammer Attacks". The Washington Post. Retrieved May 5, 2012. ↑ "NFL star named honorary captain for men's Olympic team". January 7, 2010. ↑ "Archived copy". Archived from the original on December 15, 2012. Retrieved December 11, 2012. ↑ Millado, Nate. "Interview with NFL Tight End Vernon Davis on Training and Diet | Muscle & Fitness". Muscleandfitness.com. Retrieved 2016-03-31. ↑ "Vernon Davis should be a pitchman for yams". SBNation.com. Retrieved 2016-03-31. ↑ By (2013-10-31). "Vernon Davis Inks Brand Contract with Fantex, Inc.". MarketWatch.com. Retrieved 2016-03-31. ↑ "Fantex Moves Forward With Football Player I.P.O.". The New York Times. Retrieved 2016-03-31. 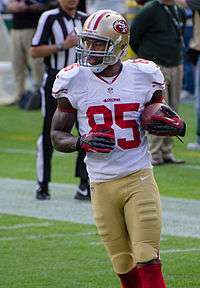 Wikimedia Commons has media related to Vernon Davis.